Ok, I’m going to try and make this a quickie post. I’ve got crown molding to paint, but I was very surprised at how well painting the bead board ceiling went. I’m pretty certain it’s because I had the right tools. After watching my dear husband deal with aches and pains after painting the bead board on the porch, I knew I’d have to come up with some better options. 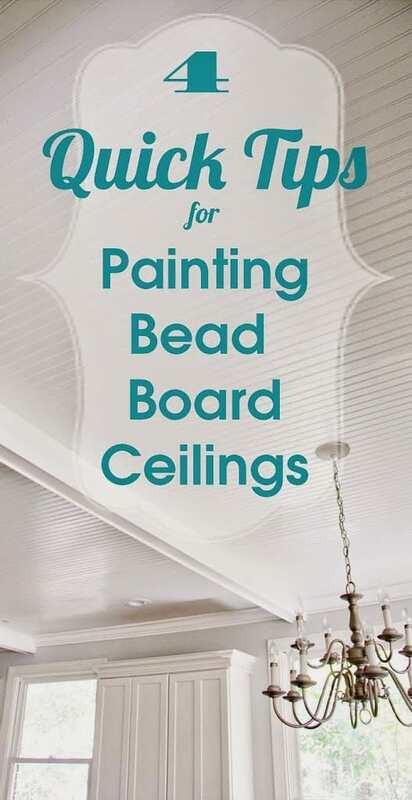 Here are my Quick tips for Painting Bead board ceiling. 1. Use a small roller and prep. And when I say this roller was durable, I should probably elaborate. Because the bead board is probably original to the house, it had several patches where the paint had kind of flaked and the ceiling was very rough. I probably should have sanded the whole thing down, but instead I just focused on the most offensive parts and just covered the rest with paint. This left spots that were pretty prickly and this roller did not shred or lose fibers at all. A sponge roller would have lost chunks and died rather quickly. 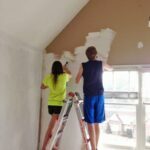 While you may be scratching your head wondering why I would choose a smaller, 6″ roller instead of a regular sized or even an oversized roller, I can tell you that there’s only so much space you can cover while standing on a ladder. The lighter your roller is, the easier it is to move around. This small roller held a surprising amount of paint, definitely enough to cover the area within reach. I didn’t want to push around a roller that could hold more paint than I could cover in one section. If I had to climb down to reposition the ladder, I might as well refill the roller then too. 2. 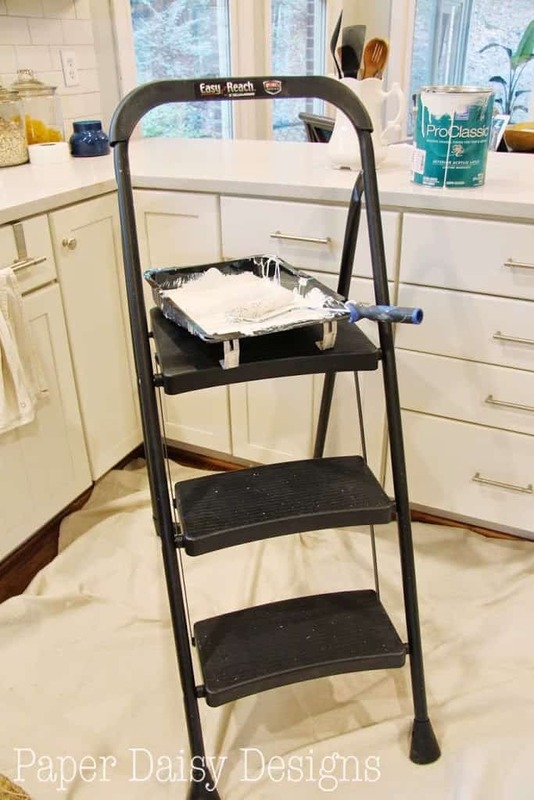 Have a stable, wide base step ladder. My dear husband recently came home with this new handy step ladder. The small ladder we had was anything but stable after years of heavy use. 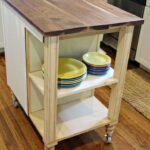 This one is easy to move and has a nice wide base at the top to move on. You can even carefully turn around on it. Even as someone as short as me, it provides enough height to reach the ceiling with just the paint handle. He did, actually, have the nerve to ask me to keep it clean. I told him I couldn’t make any promises. I was going to be using it to paint after all, but somehow I managed. (Actually, out of a kind heart, I put a piece of contact paper on the top step, but as luck would have it I don’t think I got one drop of paint on it.) He bought the step ladder from Home Depot. 3. Work in small sections. Because the kitchen is naturally divided into three sections with the newly added beams, I told myself I was only going to do one section a day. 4. 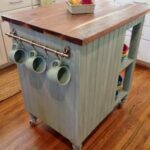 Match your original paint color and use quality paint. I’m so thankful our home already had bead board ceilings in the kitchen. That was just one of the charming details in the home that made me fall in love with it. Assuming they are original to the house, they would about 14 years old and they were in desperate need of a fresh coat of paint. I used Sherwin Williams Pro Classic Interior Acrylic Latex in Semi Gloss. 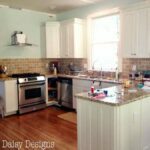 I had a custom match made of the trim in the home and painted the ceiling that color. While I’m confident that I filled in the “cracks” in the bead board, I’m certain keeping the same color is much more forgiving than changing colors, like we did on the porch. Here in lies the reason I was on my own for this bead board painting project. Dear hubby painted the porch by himself! Not only was the ceiling higher out there, but I changed colors on him! To paint that ceiling he started with a sprayer. Not a good idea because the one we have doesn’t like to be tilted. Then he moved to a heavy nap roller, which was super heavy. Even for a strong guy like him, he was very sore for several days. It’s a shame he had to suffer, but now I’ve figured out a better way to paint bead board and we all win! I think that about covers it! I’ve got crown molding to paint now! 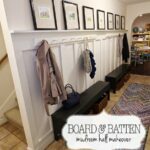 Have you ever painted bead board? Got any tips? Leave a comment and I’ll be happy to update the list! « Menu Plan Monday, What’s going with that kitchen? Good tips . I’m the process of painting it now. We didn’t sand. My husband doesn’t want to sand at this point ..wil it look bad. Rougher I know but bad. ?? If you are using oil based paint I feel like it hides imperfections better. But ideally, you would just do a quick sand. Nothing too strenuous that I would suggest skipping. Sorry, that is probably not what you wanted me to say. Thanks for reading and good luck. 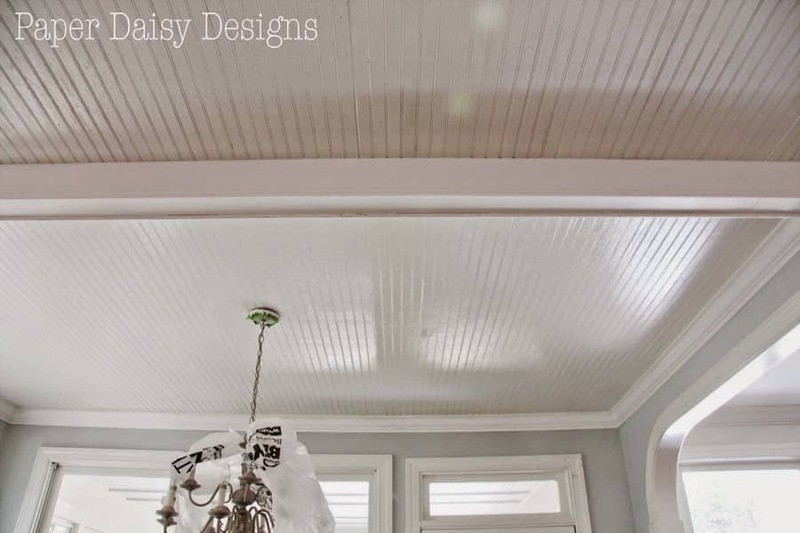 I recently purchased a home with bead board ceiling in two rooms. Both are original to the home (built in the 1930s) and are chipping. Would you scrape it first and then sand some before painting? Do you think the scraping knife to get the loose paint off would be enough?